I think this screencap sums up the results of the evening! Poor Dubya....NOT!!! Thank God it's over...almost. I'm exhausted and stayed up well into the wee hours of the morning watching the results come in and Wolf Blitzer making his dramatic projections. And hopefully after today...we can get back to regular programming. A few of us posted yesterday how there are other stories, other issues that need to be focused on...and Anderson needs to get back to "Keeping Them Honest." Here is the latest results...bound to change again this afternoon as ballots are still be counted and in some states, recounted. What did you think of the coverage last night? Did you watch any other channel besides CNN? I thought CNNs coverage was really good. I flipped over to Fox every once in awhile, but they seemed so depressed I quickly switched back...lol That was a very long night for the journalists. I notice Lou Dobbs is the only one that got to sit down. I had the misfortune of watching some of all the channels coverage last night. I hope the kids over at Fox are crying today, but tomorrow they'll be digging dirt on our newly elected officials to tarnish their entry into the next session of Congress. I TiVo's TDS/TCR to watch today. I heard that it was pretty darn good. Apparently, Don Imus didn't like any of the coverage, picking on Brian Williams. Uh...Don...your show is on MSNBC, Williams works for NBC...watch your step bucko! LOL. CNN, overdone, but done well. Especially our blue-eyed, silver hair boy. CNN was very good, though their info at the bottom of the screen was a bit confusing at times. 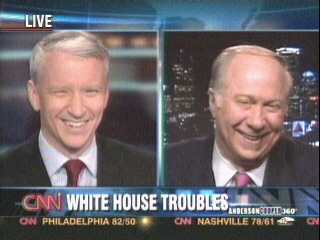 Anderson was terrific and his smiles and laughter kept me entertained--but before you think I've gone hopelessly fangirl on you, I was much more entertained by the fact that the Republicans LOST THE HOUSE and for the first time in history, the USA will have a woman just two steps from the Presidency! OMG, I had no idea!!!! 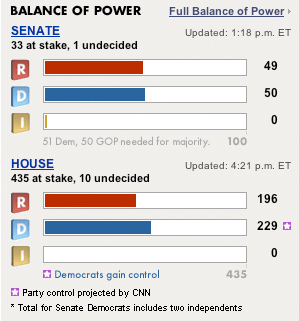 I got up this morning and saw that the Senate is tied 49-49, thinking Talent won. I CAN'T BELIEVE IT! I'm so happy Claire McCaskill is my new Senator! And the stem cell bill passed, along with a minimum raise wage hike! It's a great day to be a Democrat! @jade -- I love John King, there's something very warm about him -*sigh*. I'll take him as AC's sub any day -) It was a pleasure watching him and Candy yesterday. And AC did a great job, I think. Don't you find it strange that election coverage was without JR who's Senior National Corr and used to be a White House corr @ CBS? I know he's in Baghdad (also strange timing for him to be there )but I haven't seen him on tv all that much since they sent him there. I fell asleep around 11 and went to bed soon after. I did wake up at 4 AM and turned CNN on to find Fredrika and Rick on. The coverage was great except for the fact they forgot to put my state on the list for polls that closed at 8 PM. I did switch to a local channel for the local election coverage, but found their results ticker even more confusing than CNN. The only other problem I had with CNN was that everyone walking around so much was making me nervous. Great that now we have a woman as speaker, it's about time. Now let's get a woman in the White House. CNN.com's breaking news: Rumsfeld is stepping down. I have a request for Rumfeld: take Cheney with you, and even better -- commander-in-chief too. * Doesn't anybody know the lyrics to "Happy Days Are Here Again" anymore? * Didn't Charlie Gibson and George Stephanopoulos look like they were locked in a vast, hermetically sealed storage chamber all night? For a minute there I thought it was a new episode of "Lost." * What was CBS broadcasting in the lower third of the screen that was so horrible, KCTV felt the need to obliterate it with a gi-normous piece of wallpaper? * Why can't Keith Olbermann behave himself as well as he did last night on MSNBC? He's a fantastic ad-libber, although I sense he did write some lines in advance, like Dan Rather used to do. * Speaking of old Dan ... that thing he did on Comedy Central was sad. * Were you, like me, waiting for Anderson Cooper to trip over some wires and go headfirst into a flat screen while scurrying between panelists in that sardine can CNN set up for him? * Admit it, wasn't Fox News Channel's pattern of calling races later rather than sooner the more sensible approach? As it turned out, Democrats won more of the nailbiters than Republicans did, but by keeping strict count Fox did the "right" thing. * I did the SAT-test voting method yesterday. Where have paper ballots been all my life? They're much better than punching chads. Though I must say, at the rate that election technology is progressing, by the time I retire I expect I will be voting on a black terminal screen with green characters, as when I took the Cook County driver's exam in 1988. * So, Kansas Citians, were you surprised to wake up this morning to discover you had passed a light rail initiative? It was not unlike the six light-rail initiatives voters had defeated in the past. For all the talk about wedge issues, this one was a stealth issue, and remarkably, it passed. Can't wait for them to build that gondola ride near my house. * Finally ... do you think Rush Limbaugh will have Jim Talent on his show anytime soon? Jade I read those and I thought the same thing about Anderson. Too many wires to walk fast or not watching where you are going. @Courtney-Yay! Go MO! I stayed up to see the win and am still so excited. @Ivy-I agree about JR. I posted a few days ago that it was weird he was still in Iraq because he was going to miss some good election face time. @eliza-- exactly. And I thought JR in Iraq would be a lot more visible, it's wierd he isn't. Here's a quote about CNN's coverage from a Newsweek review I found throguh tvnewser. If the folks on Fox needed to take their vitamins, CNN seemed to have overdosed on something—or, rather, on everything. They had a blizzard of flat-screen monitors flashing so many results it was impossible to tell what any one of them said—it looked like Times Square. There were also row after row of analysts, who were constantly visited by a round-robin rotation of anchors. At least the network helped us identify the players without a scorecard. Did you notice how all the Republican consultants wore red ties while the Democrats wore blue? Very clever.